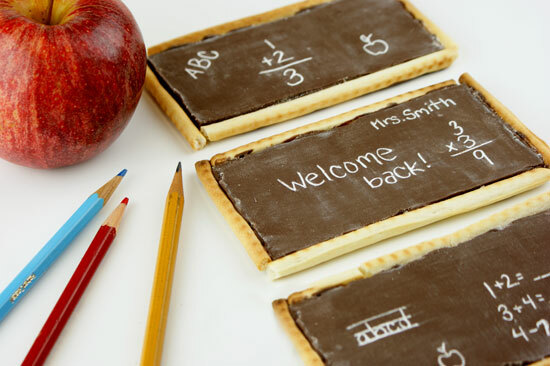 A great idea for back to school or teacher appreciation! 1. Melt Chocolate CANDIQUIK® Coating in Melt & Make™ Microwaveable Tray according to the package directions. 2. Smooth the entire tray of coating onto a large flat surface covered with parchment paper. 3. If desired, sprinkle almonds or salted peanuts on top of the coating. 4. Once completely dry, cut the chocolate into rectangles about 5 x 2.5″. 5. Using a toothpick, etch your designs on the back side of each chocolate bar. 6. Smooth powdered sugar over the bar. 7. Use your toothpick to apply coating to the edge of the bar and press the pretzel sticks on. TIP: clean up the chalkboards with a partially wet paper towel.